For the first time, here is a book that tells the whole colorful history of America's other music. There have been many volumes published about jazz, Tin Pan Alley, blues and show tunes. But never has a book been devoted solely to words and pictures about the exciting 40-year developments in country and Western music. In no other area of American popular culture have elements of show business, religion, comedy, sentiment and circus been so thoroughly mixed. Vaudeville never died. It moved to Nashville, Tennessee. The medicine show, whose glib salesmen hawked patent remedies for every ache and pain of body and spirit, never died. It just moved to Nashville. The Minstrel show, with its outrageous jokes strewing corn in every comic exchange, never died. It scrubbed the paint off its face and moved to Nashville. Nor did the great American rural tradition of homemade music die in mountain shacks or at ranchland campsites. Just as the Industrial Revolution moved handicrafts from the hearth to the factory, so have the fiddle tunes and ballads moved to the music factory called Nashville. So begins the fascinating story of country music. Here is the history of country music: its origins, its varieties, its stars and innovators, and all the other features that have made country music the most popular music in America today. To complement the text are literally hundreds of photographs of musicians and country-music memorabilia. Here is the colorful world of country music from the old-time rustic music to the Nashville Sound. Here is the great Jimmie Rodgers, who in his brief career gave form, shape and content to the music of the hillbilly and laid the foundation for commercial country music; the Carter Family, whose style of close-harmony singing set the style for dozens of groups to follow; Roy Acuff, who bears the title of "The King of Country Music" with a humility rare to most royalty; Woody Guthrie, who has probably told more city people about country people, than any other performer; Hank Williams, whose tragic life ended at 29 but whose records and songs are ever popular; Johnny Cash, who is so versatile that he can move through blues, railroad songs, ballads, hymns, "story" songs, love, and Western songs with equal ease. Here also are the fabled singing cowboys such as Gene Autry and Roy Rogers who left their stamp on the movies of the 1930's; Flatt and Scruggs, the Bluegrass greats; and the style-setters who have recently reached stardom, such as Chet Atkins, Roger Miller and Buck Owens. The romance of early radio brightens the story, for country music has been a factor in rural broadcasting since the days of carbon microphones and crystal sets. The "Grand Ole Opry," that marvelously colorful show, was first broadcast in 1925. It is still going strong, reaching some 10,000,000 loyal listeners every Saturday night. Many of the songwriters are talked about and pictured. Some of them are famous as performers, such as Johnny Cash, Hank Williams, Jimmie Davis, former governor of Louisiana, and Roger Miller. Others are best known as songwriters, such as Marie Travis, Aunt Molly Jackson. Lefty Frizzell, Carson Robison. Dorsey Dixon and Jimmie Driftwood. 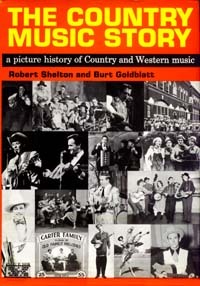 The Country Music Story is a must for all country and Western music fans. Robert Shelton is the former folk and country music critic for The New York Times and has been observing the country-music scene at first hand for many years. Burt Goldblatt is a designer, illustrator and photographer. His paintings on music were exhibited in Washington, D.C., and by the U.S. Department of State in five European countries.